On November 5 the Boston Celtics were taking on the Denver Nuggets in Denver. In the past, there had not been any major feuds between the teams, but that might have changed on this night. 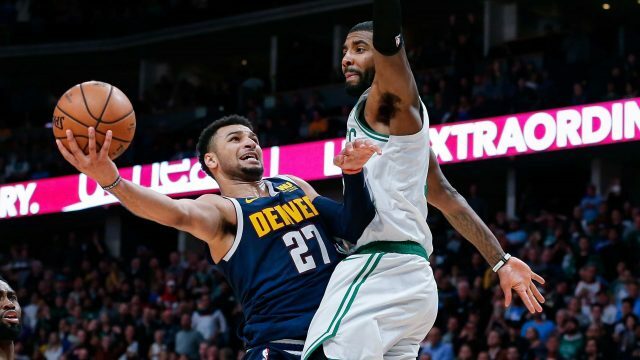 With the clock winding down on regulation and the Nuggets up 115-107, Jamal Murray decided to hoist up a deep three-pointer. He had 48 points and was trying to break the 50-point mark with this last second heave. To most, it seemed harmless, but to Celtics guard Kyrie Irving, it was selfish and “not cool”. Murray’s shot missed and fell near Irving, who then went on to throw the ball into the stands. He was acting out of frustration after the tough loss and out of annoyance over Murray being selfish and trying to break 50 points. For this, Irving was fined $25,000. Many people believe Irving should not have been fined, as throwing the ball into the stands after regulation isn’t seen as a big deal to the fans, a lucky one wins a game ball! But he was fined and it was a hefty one at that! In a league full of scorers, tons of players are chasing big stat lines. Have it be Russell Westbrook having been only the second player in NBA history behind Oscar Robertson to average a triple-double over the course of an entire season, or Klay Thompson recently breaking the record for most three-pointers made in a single game (14 to be exact). Players are always trying to show up and put up big numbers, but the way you go about it is what it comes down to. Jamal Murray was having an amazing game, scoring 48 points with 19 coming in the fourth quarter. He could’ve held the ball as the last seconds of the game ticked down but instead chased a big feat in his young illustrious career. Now, there will definitely be some bad blood between the two teams when they go head-to-head again on March 18; at least between Irving and Murray. Joshua Brubaker is a student at the York College of Pennsylvania majoring in professional writing.